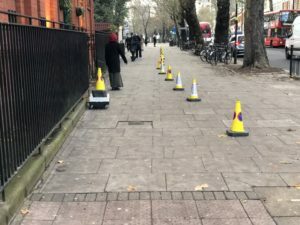 This campaign has been launched by residents of Chiswick and Hammersmith who do not believe that the current design of Cycle Superhighway 9 is in the best interest of our vibrant community of homes, businesses, shops and restaurants. This is Redesign CS9. What? Huh? Who? We know there is a lot (ok, a real lot) of ranting and raving about the Tfl proposal for the CS9 Cycle Superhighway running through King Street in Hammersmith, Chiswick High Road and points beyond. We know there are several different petitions against the proposal circulating in both Boroughs, and we know there are many stakeholders doing their level-headed best to engage councils, councillors, Tfl and anyone who will listen to ensure voices will be heard. That said, we also know there are plenty councillors who are fully engaged only to be silenced by the Cabinet. But we did think………..Why not consolidate? Why not make it easier to investigate and provide folks with opportunities to engage as they see fit? Please bear with us as this is all new and changing quickly, so if you should know of pertinent information, send it along and we’ll add it. To us, it isn’t about who or what you support in the polls. Or on what, if any, greater being you rely. To use it’s about Community, And all that goes with it. All parts of a balanced equation that should be fair for all. Just all. Not one group over another. We are a growing group of residents, business owners and community leaders who would like to see a more collaborative and through initiative being undertaken to improve cycling infrastructure. For those that choose to cycle. But it shouldn’t be at the expense of those who don’t. High Streets are no place for cycle superhighways.